When the Houston Hobby Center’s Sarofim Hall can fill its 2650 seats on a mid-week evening (with orchestra seats topping $200), then it is safe to assume a major event is anticipated. That it certainly was when the GEXA Energy Broadway production of CATS took to the stage for last Tuesday’s Opening Night. Those attending in expectation of eye-popping spectacle on a grand scale would not be disappointed. As best I can recall, after seeing the long running (18 years) Broadway production in New York some three decades ago, this edition (directed and choreographed by Richard Stafford) held very true to the original, though I think I remember the cats that prowled through the Winter Garden audience even had access to climb into the balcony. Under a cloud-streaked full moon, the immense and dream-like set (set design, John Napier with scenic design reproduced by Raymond Huessy), was fully revealed on stage as the audience awaited arrival of the cast. It depicted a misty, dark green world that at first looked like a sunken ship deep beneath the sea. But on closer examination, what we really have is the huge and mysterious junkyard where our cats will play out their many scenes (with lyrics based on the T.S. Eliot poems in “Old Possum’s Book of Practical Cats”), while accompanied by the monumental musical score of Andrew Lloyd Webber. That music, impressive as it was, had me wondering if an explosive Vegas-style soundtrack was being used since there was no visible orchestra or conductor in the pit. During the intermission, house officials gave me varying stories about this with one telling me that the seven “Touring Musicians” listed in the program (including Musical Director, J. Michael Duff), were sequestered beneath the stage. Another explained the musicians were backstage behind the set. Take your pick, but none were acknowledged during the curtain calls. 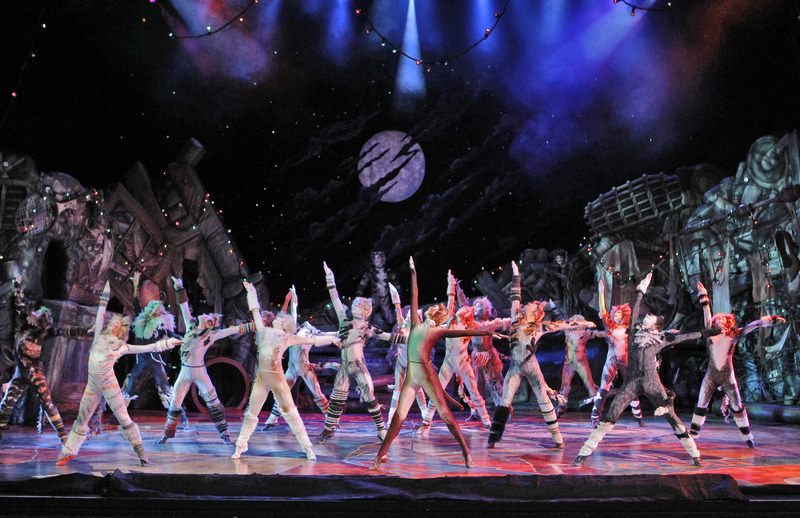 As the many exotically costumed cats begin to slowly emerge during the opening excitement of, “Jellicle Songs for Jellicle Cats,” there are eye-catching flashes and beams of light to sharply awaken the audience while strings of colorful holiday lights surround the room embracing the theater. Some of the cats enter right through the audience and one, with electric green eyes, startled me with a brief confrontation at my aisle seat. The extraordinary costumes (designer, Mr. Napier), and dazzling lighting (designer, David Hersey), would serve as useful distractions from the one central problem of the production. To be specific, because of the often overpowering style of the music and the frequently rapid-fire delivery of the lyrics, much of the time the words sung are unintelligible to casual listeners that may not be familiar with the lyrics or the Eliot poems beforehand. That impression was verified not only by the guest who accompanied me, but also by an intermission conversation with a lovely couple seated behind us. The wife expressed her concern at not understanding the lyrics by saying, “It all sounds like a lot of Mumbo Jumbo to me!” Fortunately, the many lovely melodies of the score and the captivating spectacle of the production manage to keep that problem at least somewhat in check. 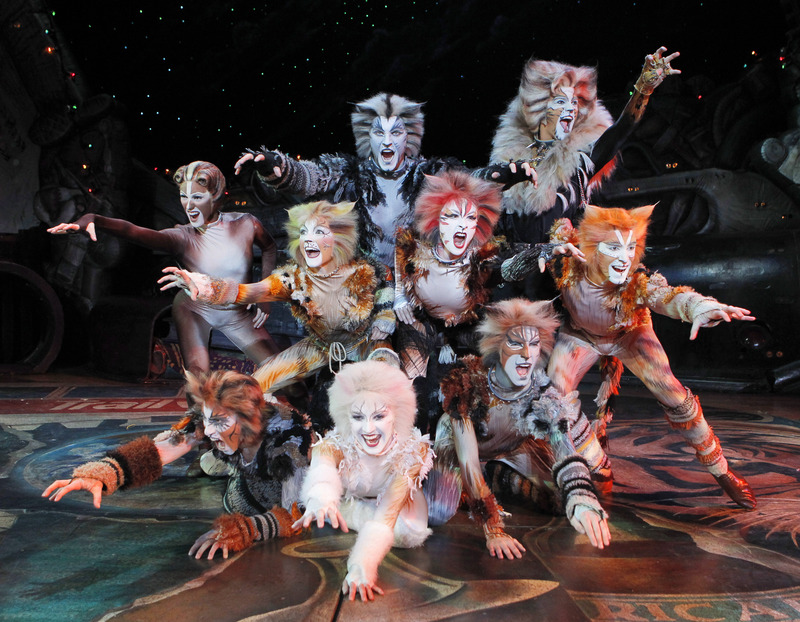 But for those fans that have familiarized themselves with the Cats cast album for years, this would not be an issue in an otherwise very impressive production. In Act II a very articulate (and understandable) Laura Cable plays Jellylorum, the cat who sings the lovely introduction to, “Gus, the Theatre Cat,” (Another role for Bronson N. Murphy). Murphy then follows with a third characterization as a pirate in a seemingly overlong number titled, “Growltiger’s Last Stand.” Sometimes reminding one of “The Small House of Uncle Thomas,” from The King and I, it is an elaborate and swashbuckling flashback from Gus, recalling his acting days and his stage role as Growltiger the pirate during a sea battle with the Siamese cats. 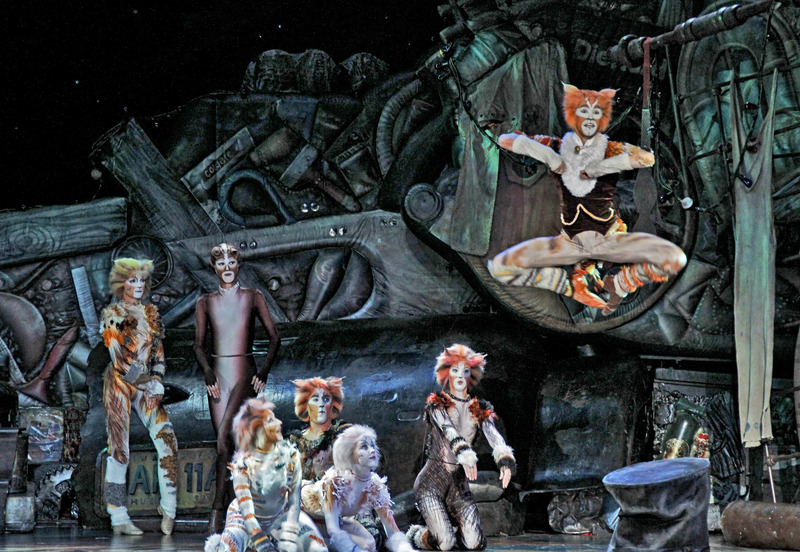 The full company joins Louie Napoleon while he ignites the stage as the merry and perky, “Skimbleshanks.” J. Morgan White portrayed the feared criminal cat, “Macavity,” in a number with choreography that seemed part health club dance aerobics, and part burlesque show. Chris Mackenthun plays the mysterious magician cat, “Mr. Mistoffelees,” amazing onlookers as ribbons of silver foil shot from his hands to anoint the audience. Dressed in glittering black, his whirling dance solo had a magic of its own. Saving best things for last one cannot overlook the stunning performance of Kathryn Holtkamp as the aged and decrepit cat, Grizabella. Looking like the desperate and fading Norma Desmond in Sunset Boulevard, Miss Holtkamp was clearly the right choice to bring a soaring and thrilling voice to the show’s one truly memorable song, “Memory.” The full company is thrilling as well as Old Deuteronomy chooses Grizabella to be dramatically escorted heavenward during the rich chorale of “The Journey to the Heavyside Layer.” It was like a “Hallelujah Chorus,” but when all was said and done it would be the “Memory” that lingers on! This entry was posted in Miscellaneous Reviews, The Courier Columns, Theater Reviews and tagged Broadway, Entertainment, Houston, musicals, Reviews, Texas, theatre. Bookmark the permalink.